“For a moment, I’d like to ask you to close your eyes and imagine yourself as a child,” Beckham says. Beckham draws all of his pieces by hand. “Today, I want to share with you a moment when I truly lost my wings. But through that experience, I actually learned what it truly means to fly." 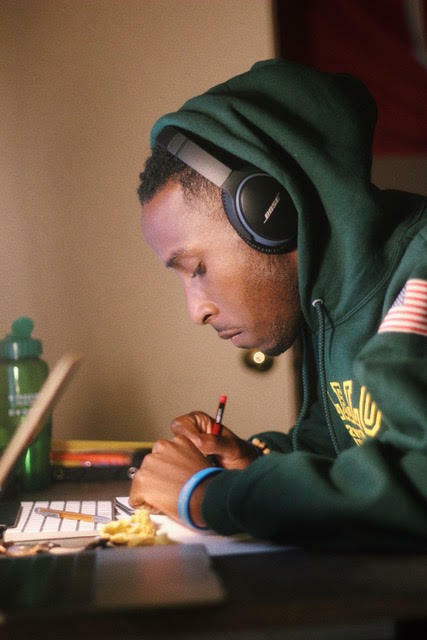 In high school, running was how he felt a sense of purpose in life. But when he broke his foot twice in college, he took it as a sign that he needed to find a new passion to fill his downtime. Beckham uses his art to share motivational messages. Before long, it evolved into a fully animated character with a face, a name, and a personality. Beckham's friends started asking him to draw custom pieces of art for them using the lightbulb to tell their story or express their ideas. 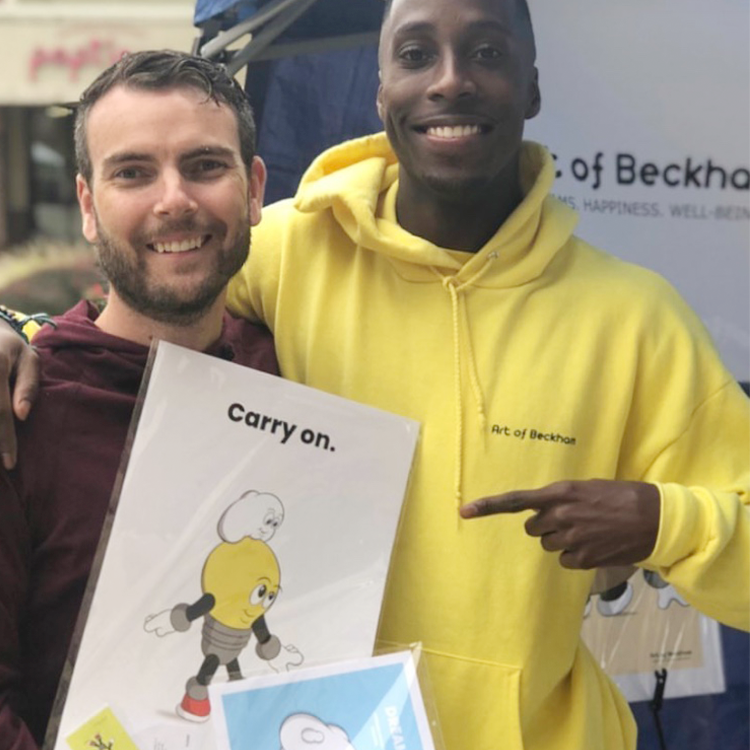 Over the last four years, Beckham has not only continued to draw, he's created a whole cast of cartoon-like characters who run around his mind and make up their own personalities and storylines. He talks about him like they’re his friends. Idea is Beckham's first and main character. “Let me introduce you to my characters,” he says, and a smile spreads across his face. His characters are all simple, everyday objects that have been reimagined with a symbolic, powerful purpose. 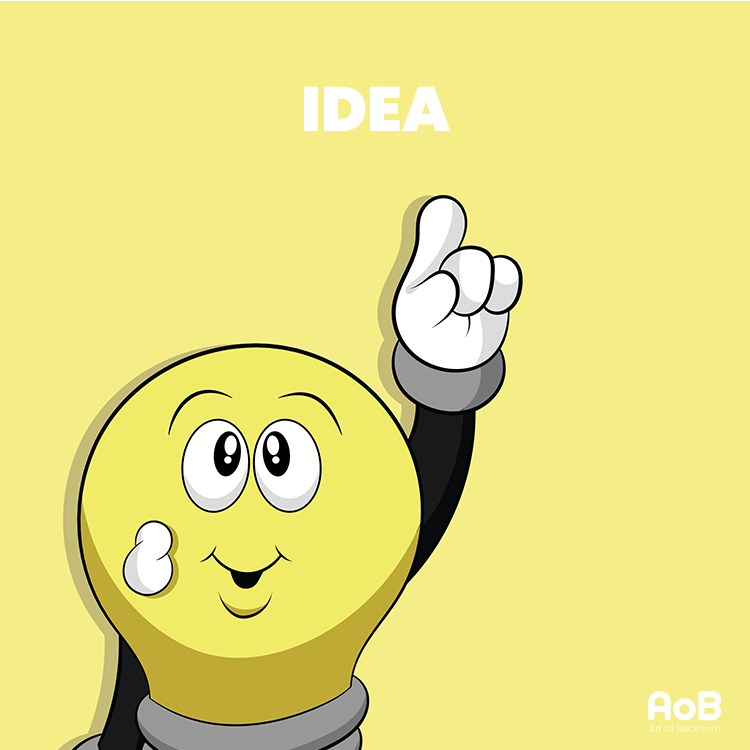 The main character is the lightbulb, whose name is Idea, and he’s almost always smiling. “He’s a charismatic light in his own life in which he leads us to find the treasures that we have buried deep inside of us,” Beckham says. Idea’s sidekick, Dream, is his best friend. Dream is a cloud who is imaginative, brave, and always on the move, Beckham says. 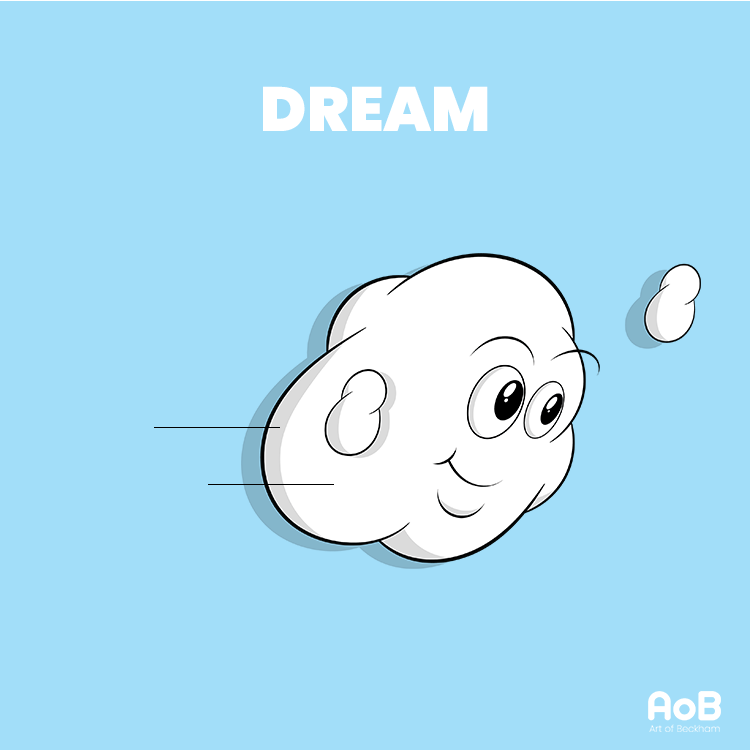 Dream is a fast-moving cloud. “Although he looks very inviting, he’s not always easy to grasp,” he explains. 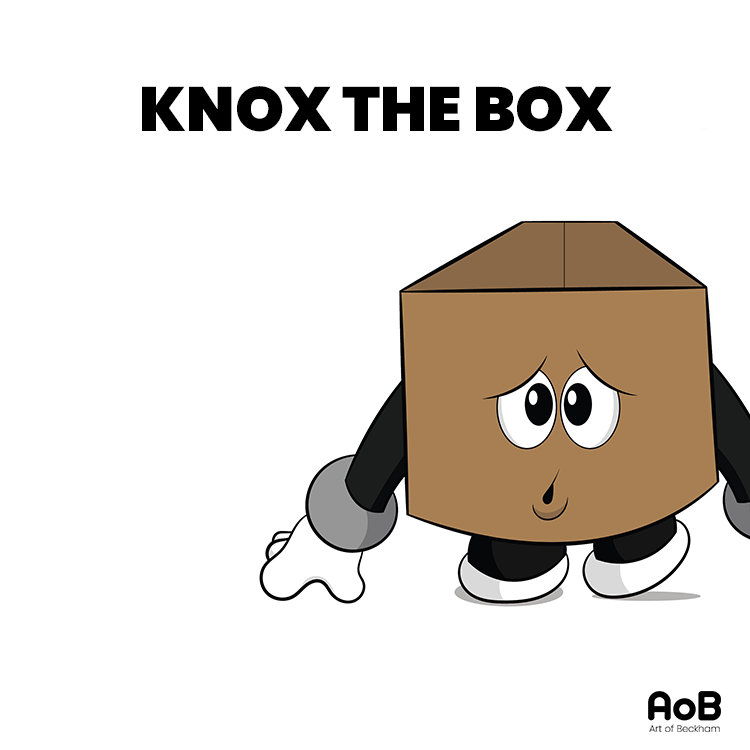 Then there’s Knox the Box. He looks like a simple box, but there's more to him than you might expect. In fact, of all of Beckham's characters, Knox is perhaps the most complicated and the most misunderstood, he says. Knox started out as the villain who would try to box Idea in. But the more Beckham drew him, the more he realized there was more to his story than that. “Can I share Knox’s narrative with you really quick?” Beckham asks. He says that Knox was a box who used to love helping people. He opened himself up to allow people to put their treasures inside of him—their most prized possessions. But then people came back and took things away from him, and he got bitter about it. He also let people stand on top of him to reach higher places, and after they used him, they left him behind. “Knox became so selfish, so resentful of people that he closed himself up,” Beckham says. “He just doesn’t know how to trust people again, so he’s a closed, sad box who wants to box people in and limit them.” Knox is more than just a box or a villan. But that’s not all he is. Knox has a treasure, too. After coming up with the first three characters, Beckham created a family of three more. A donut family, to be exact, just because he likes donuts. 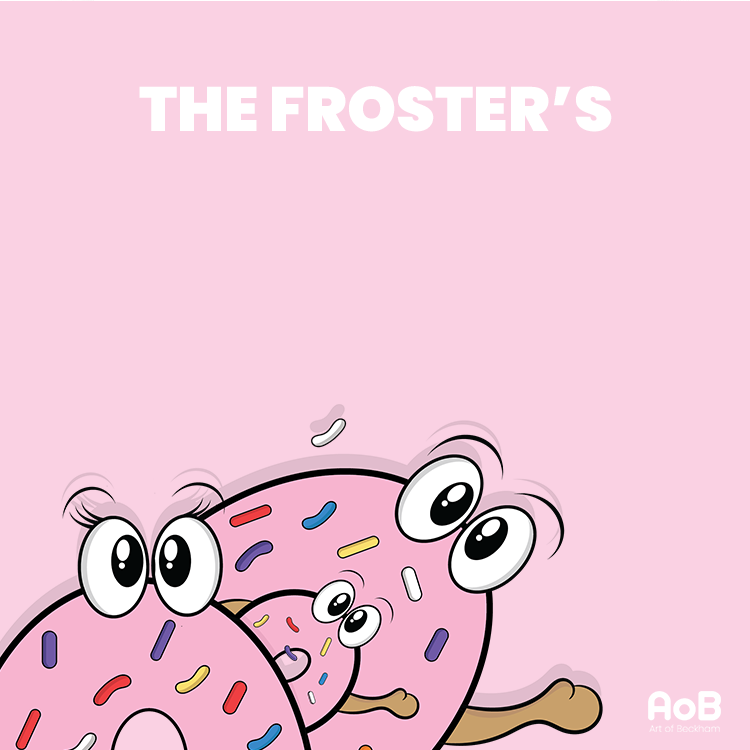 He calls the donut family the Froster's. Beckham explains that his own family has been an inspiration to him in his artwork. His mother, father, and two brothers (close to him in age) were the first ones to believe in his art and support him back home. “They’re just … the best ever,” Beckham says. The Froster's are a family of donuts. His father is a pastor, and his mother is an artist. His younger brother is into politics, and his older brother is into bodybuilding. But while they have different interests, they all share a common desire to do good in the world. Today, Beckham is a part-time graphic design intern in Fort Wayne while earning his master’s degree in marketing at Indiana Tech. He’s drawing custom illustrations of his characters for friends and clients in his spare time, and he's currently updating his website to showcase his characters and products. He sees his art as a way of paying forward his family’s spirit of encouragement and hope that he grew up with. And across northeast Indiana, the Art of Beckham is making a difference. 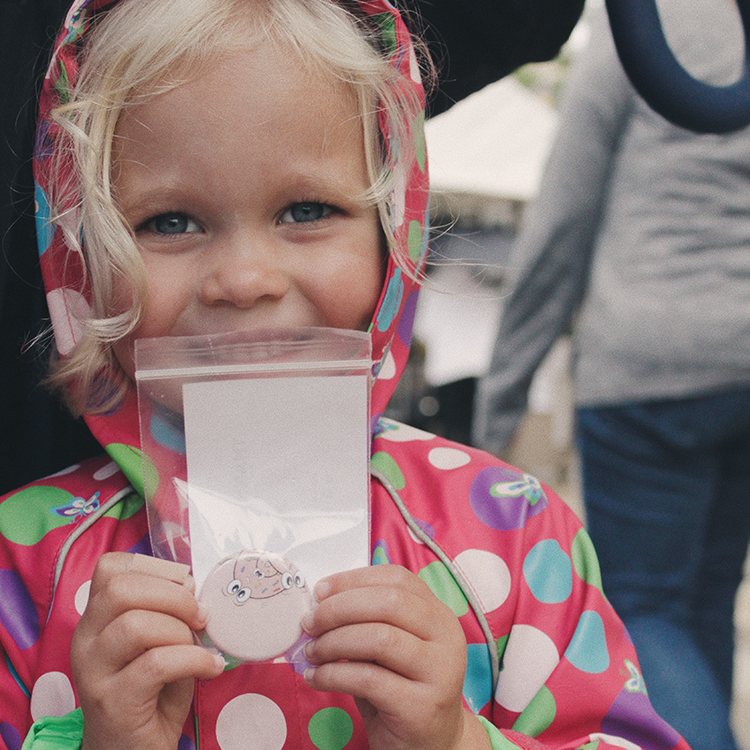 In August, Beckham participated in his first highly successful art festival at Jefferson Pointe where he introduced Fort Wayne to his characters and sold hand-drawn prints and buttons to fans young and old. “There was this lady, she bought a button of every character, and she told me, ‘If I could buy this for every person in my family, I would,’” Beckham says. Beckham sells buttons with his characters on them. Now, he’s writing a series of children’s books about his characters, too. His first book is called If You Knew You Could Fly. It tells the story of how Idea first met Dream, and how with a little imagination, anything is possible. For inspiration, he doesn't have to look far. Children enjoyed meeting Beckham's characters at Jefferson Pointe. But he also knows that being a kid, like being an adult, isn’t easy, and perhaps that’s what gives his work such broad appeal. While his characters may be fictional, his message rings true. Davonta posts updates about Art of Beckham on Instagram and Facebook. See his website at www.ArtofBeckham.com.